I don’t know what these things are called, but lots of people photograph them and never get tired of liking them. I was testing out my new Holga to see how it worked. One of the lows of photography for me is that people seem to want to see the same thing over and over again. You can’t go to Paris and avoid the key sites such as the Eiffel Tower, Notre Dame, and Sacre Coeur or London and miss Parliament, the Tower of London, or the London Eye. I surrender to these desires, but I sigh because my viewers ignore better photographs of more obscure subjects. Sigh. 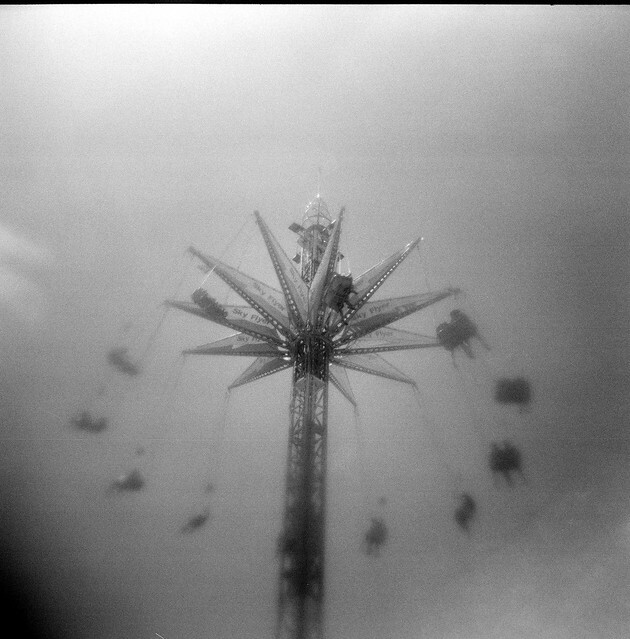 Posted in Diffusion Fiilter, Holga 120N, OC Fairgrounds Tagged amusement park ride, analog, black and white, fairgrounds, film, OC Fair, summer.